Pediatric migraine symptoms are frightening and debilitating, Worse, many doctors don’t know how to treat pediatric migraine in small children or teens. When children get migraines, their symptoms are often much different than the ones experienced by their parents or other adult migraine sufferers. With children, migraine attacks usually occur in the stomach. Most of the time, kids with migraines report feeling suddenly sick to their stomach, fatigued, and feeling the urge to vomit right away. Most- nearly 80 percent- have a very hard time focusing on school work because of a migraine attack, and their grades and attendance suffer as a result. How common are pediatric migraines? Migraines seem to increase with age, although it’s hard to be certain, as children under the age of five have difficulty explaining symptoms to their parents that may indicate migraine. Only about 3 percent of preschool kids get migraines, but that number escalates to 11 percent by the time they reach grade school. Among high school students, nearly a quarter experience frequent migraine headaches, fatigue, dizziness, stomach pain, and extreme sensitivity to bright lights. Just as with adults, most teen migraine sufferers are females. Do migraine drugs help children? Currently, there is no clear evidence that migraine preventive medications for adults can help children, as well. Though the FDA approves the use of antiseizure drugs (Topamax), antidepressants (Elavil), and calcium channel blockers (Covera) to help prevent migraine attacks in adults, many studies show that for pediatric migraines, prescription medications aren’t always the best option. Recently, scientists studied the effects of migraine prophylaxis medications on children with “episodic migraines,” migraine attacks that occur fewer than 15 times per month. For the study, researchers focused on anticonvulsant medications, antidepressants, calcium channel blockers, antihistamines, NSAIDs, and drugs for high blood pressure- all of which are often prescribed for adult migraine prevention. In most cases, the placebo was most effective at reducing the rate of migraine attacks in children, while the migraine preventive treatments had virtually no effect. Study co-author Dr. Jeffrey Jackson concluded that despite the amount of research we have collected over the years on the best ways to prevent migraines, we really know very little on how to help children who suffer debilitating migraine headaches. When asked to comment on side effects associated the migraine prophylaxis meds, Dr. Jackson agrees that parents shouldn’t rush to administer the pill right away. Experts agree that natural prevention is your best defense against migraines, for children as well as for adults. As a parent, you can best help your child by helping her to become familiar with common migraine triggers in food. Caffeine can sometimes make headaches worse, or it can provide relief; it’s different for each individual. Overripe fruits, chocolate, and deli meats are typical menu items that can guarantee a migraine attack. To find out which foods should be cut out, try putting your child on an elimination (restrictive) diet. Irregular eating and sleeping patterns are common culprits. Does your child sleep the same hours each day, or does she go to bed late on weekends? Does she ever skip meals? The migraine brain hates change, so instilling a rigid sleep and eating schedule is a good way to prevent migraine attacks from occurring. Stress is a big contributor to migraines, as well. While stressful situations don’t actually cause migraine headaches, they do make them more likely to occur. If your child gets migraines with aura, then teach her how to recognize the symptoms and use them to her benefit. Flashing, twinkling or shifting light patterns, dizziness, and speech slurring are all cues that a migraine is approaching. At school, your child should ask to see the nurse and explain that she is having a migraine aura, and needs a few minutes to lie down with the lights turned off. Many parents have also found that natural supplements help with pediatric migraines. Herbs such as butterbur are safe for children and adults alike, and cause no harmful side effects. Other helpful nutrients for migraines in children include magnesium, vitamin B2 (riboflavin), and coenzyme Q10. Nevertheless, please consult in a doctor before trying out any new migraine treatment for your child, including natural vitamins, minerals, and herbs. 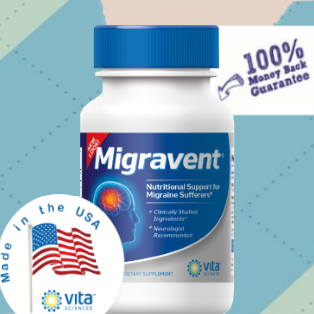 Migravent is safe for all ages. What medications have you found to be most helpful for preventing migraines in your child/children? Do you and your child both suffer from migraine attacks? Image by Jay/Flickr CC license. No changes were made.